Free snorkeling and paddle board, hot water, mosquito net, nice bungalow. Staff was very friendly and helped us with tipps for the island. Location is nice and the common area direct at the sea is a nice place to sit in the evening. Overall vibe was also cool. very cool place to stay. the staff is welcoming and helpful. the secret bar is the perfect place to watch the sunset. Very friendly staff!! That location, price and staff are the best. Location is good Staff are excellent - the atmosphere they create is so friendly and inclusive it makes up for any lackingings in the quality of accomodation. There are evening activities going on most days. Would definitely stay again!! I stayed in a studio apt and the bed was huge! The sounds of the river at night and the ocean in the morning makes you forget any imperfections of the property... This place with its lovely staff will provide you with anything you need to enjoy a relaxed vacation far away from the touristic Koh Phangan. Rooftop Bar ist super! Wasser gibt es an der Rezeption umsonst. Located in Haad Tian, Secret Place Backpacker provides air-conditioned rooms with free WiFi. The property has an ATM and ticket service for guests. 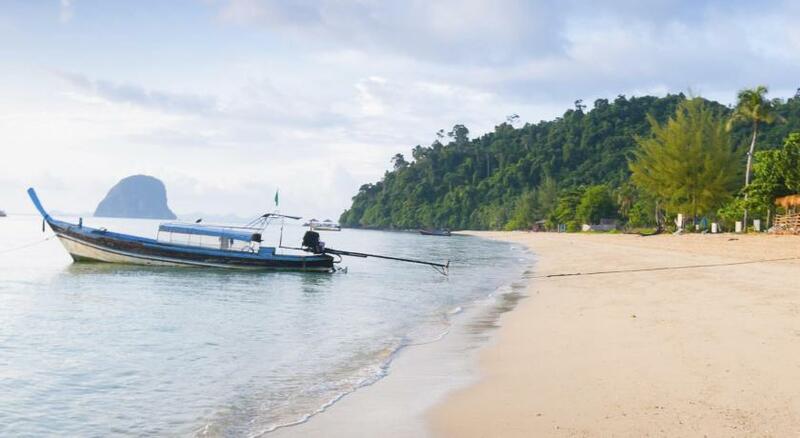 Ko Phangan is 13 miles from the guesthouse, while Haad Rin is 13 miles from the property. This property also has one of the top-rated locations in Haad Tian! Guests are happier about it compared to other properties in the area. When would you like to stay at Secret Place Backpacker? House Rules Secret Place Backpacker takes special requests – add in the next step! The property is going through renovation works. During this period, guests may experience some noise or light disturbances, and some hotel facilities and services may not be available. Simple: my room was in front of a construction site, which was not indicated. When i complained, they shrugged it off. The noise was super unconfortable. The room was ok, not that confortable. Dark walk at night to bungalow, lots of obstructions, communal space long walk from room. It was very dirty, all the floor full of sand and dust. The bathroom was disgusting and it doesn’t have hot water. In the night the mosquitos attacked you, even when you close everything, because the bungalows are build very badly. Even though was cheap, it could have better facilities. It was like being in the middle of a jungle, with no hot water, Toilet flush was actually a bucket. No windows, but a screening panel. We stayed two nights in the cheapest room. The room was totally worn out. From the mosquito spiral which had fungi to the towels and blankets provided. Wifi wasn't working. These rooms are at the back of another hotel and the path to get there is dark and muddy. It rained heavily on the second night and the roof started leaking. We were changed to another room. The other room was ok, we stayed more nights as my boyfriend got sick. Cleaning could definitely be improved. We stayed for a week after we had changed rooms and nobody even came to take out the trash. They could also put a kettle in the room and a small fridge as in every other hotel with these prices. Soft drinks are 40B when they are 25B in the restaurant next to the hotel. Rene and Spencer were really nice, but some of the staff don't even reply to you. We asked one of the girls for new sheets, she put a grumpy face and didn't say anything. After a couple of hours she came with the new sheet, still with a grumpy face. She didn't take the dirty sheets and didn't bring pillow cases not new bed cover. They are about to open a bar next to the beach with a really nice view. There are a couple of cheap places to eat nearby. Accommodation was very basic and I shared my room with a large gheko, amongst a few other animals. Don’t be fooled by the 9+ ratings...the accommodation is extremely basic, not clean and definitely not worth the money. If you just need a roof over your head to sleep it’s fine. You can easily find better places for the same money at the area. Toilet did not have a flush and the bathroom was dirty. Shower did not work really well. The “deluxe” bungalow itself was very small and the bed and mattress was old, hard, humid and had dents in it. The bedsheets were far away from clean. The fan was full of dust and did not work so it was extremely uncomfortable to sleep during the night because of the heat and the bad condition of the mattress. Worst of all was the water that came out of the tap was dirty and smelly. So we did decide to not use it for washing our hands or brushing our teeth. Other places on the island had perfect clean water during this time. It was the worst accommodation we had during our 3 months travel in Asia. Very nice place with the gray view. Electricity in the room was unstable, the lights would dim every few minutes, especially if the air conditioner is on. Cleanliness should definitely be improved... Bathroom had stains and there was sand in the bed. Also a lot of ants coming into the bed. Provided towels were pretty worn out. The roads in Haad Yao are quite hilly, on a scooter its not a problem but if you're silly like me and use a bicycle its challenging but not impossible.